Major Histocompatibility Complex (MHC) molecules display antigens to T cells, immune cells that constantly check for infected or damaged cells. If T cells spot MHC molecules with foreign antigens or mutated self-antigens (such as cancer antigens), they kill the cell before the damage spreads. 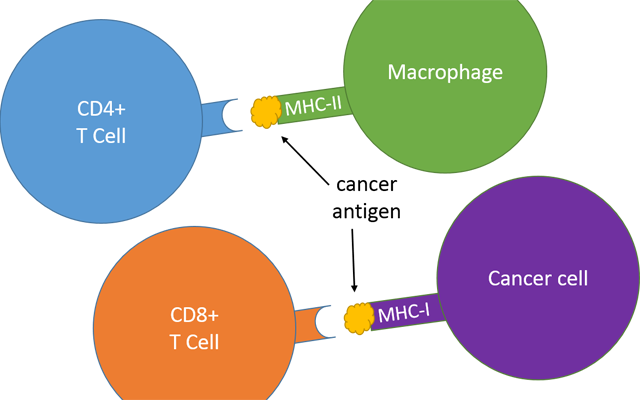 MHC-II is only displayed by professional immune cells, such as macrophages, and is recognized by CD4+ T cells. MHC-I is displayed on the surface of every cell, and thus any cell with the potential to become cancerous, and is recognized by CD8+ T cells. Additional study co-authors include: Wesley Kurt Thompson and Rany M. Salem, both at UC San Diego. This research was funded, in part, by the National Institutes of Health (DP5-OD017937, 1R01GM104400, RO1CA220009, P41-GM103504, U54CA209891), National Science Foundation (graduate research fellowship 2015205295), Canadian Institute for Advanced Research (CIFAR Azrieli Global Scholarship) and Fred Luddy Family Foundation.